See also: Peanut Butter; Peanut Oil; Peanut Gallery; etc. Boiled Peanuts were designated as the Official Snack Food of South Carolina in 2006. 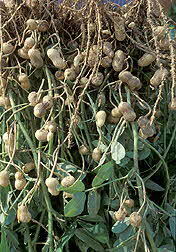 The peanut (Arachis hypogaea) is actually not really a nut - it is a legume, the same family as beans and peas.